Does the child poverty agenda now belong to the Conservatives? Declan Gaffney looks at the British Social Attitudes Survey 2011 and asks whether the child poverty agenda now belongs to Iain Duncan Smith’s Conservatives. Findings from the British Social Attitudes survey for 2011 published today show strong support for reducing child poverty (82% regard this as ‘very important’) and for central government taking the lead role in this (79%). On the face of it, this might look like a remarkable endorsement of Labour’s prioritisation of child poverty while in power. However, the public judgment on Labour’s record is negative: 46% of people believe (erroneously) that child poverty increased over the ten years to 2009, while only 12% believe (correctly) that it fell. Moreover when we look at the factors the public regards as important in driving child poverty, it is clear they see the issue in overwhelmingly conservative terms, blaming drug and alcohol addiction, laziness and family breakdown far more than low pay, social inequality or lack of affordable housing. 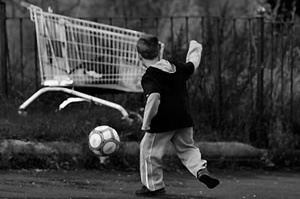 Child poverty is thus seen much more in terms of personal failure than social or economic factors. For supporters of the social democratic elements in Labour’s approach (always much stronger than its rhetoric while in office suggested), these should be devastating findings. The target of eliminating child poverty by 2020 was not only emblematic of Labour’s continuing commitment to social justice: it underpinned much of what was most successful in its social policy agenda (Sure Start, increased employment for lone parents, tax credits). But the implication of today’s findings is that by raising the profile of child poverty, Labour has ultimately provided a boost to conservative disagnoses of social problems and to the policies of work and pensions secretary Iain Duncan Smith. Bear in mind the Conservative (and increasingly Lib Dem) strategy on child poverty is to redefine the issue in terms of smaller scale more severe problems, focusing in on what can be presented as the extremes of social dysfunction and away from more general factors such as redistribution, labour market conditions and childcare provision which were at the centre of Labour’s approach. Thus small minorities of ‘poor families’- those facing the greatest challenges – are presented as representative of child poverty in general, even though the conclusion from most research into poverty is that the only thing poor families generally have in common is that they haven’t got enough money. It now seems clear this strategy connects with public attitudes and beliefs. For example, 75% of respondents to the survey think drug and alcohol addiction are one of the reasons children are in poverty, while 20% think they are the main reason. These are by some margin the most commonly cited factors in the survey. In fact the prevalence of addiction among parents is of a completely different order to that of income poverty: for example, 2.7% of parents in all couple families (not just poor couples) are estimated to have a problem of alcohol dependency, while the poverty rate for children in couples is 24% after housing costs (see “Mental health and child poverty”, Nick Gould [pdf]). This lack of fit holds for drug dependency and for lone parents as well. Clearly addiction can only make a minor contribution to overall child poverty, but it looks as if political messages that conflate the two will resonate with the public. Only last week, Mr Duncan Smith cited drug addiction as an argument against increasing the incomes of the poor: today’s survey results indicate this argument will be widely accepted. The only element in the Conservative diagnosis which is roundly rejected by the public is its exaggerated claims about the intergenerational transmission of poverty: only 3% of respondents believe this is the main reason children are poor. Otherwise, the BSA results are an endorsement not of Labour’s social democratic approach but of the world-view of Iain Duncan Smith and Labour’s social conservatives, such as Frank Field and Graham Allen. For the coalition, this will strengthen the case for redefining the relative income measure of child poverty which Labour hung around their necks before leaving office through the Child Poverty Act. For some in Labour, it will count as evidence for the political unsustainability of social democratic strategies. But the main lesson may not be about policy so much as language. ‘Child poverty’ was always an ambiguous term. For progressives and social democrats (and most academics and economists), poverty is essentially an issue of distribution and employment, but the wider and generally negative connotations of the word ‘poverty’ cannot easily be dispelled. That may just be an inescapable implication of any use of the term ‘poverty’, which historically has always involved connotations of loss of status and dependency. Thus to centre progressive policy around the notion of poverty was to sign a Faustian pact with inherited connotations of exclusion and dependency which ultimately only serve to support conservative disagnoses – such as the grossly exaggerated role ascribed to addiction. ‘Poverty’, for the time being at least, belongs to big and small ‘c’ conservatives. One option for social democrats is to let them keep it; as Bell and Strelitz suggest, “forget child poverty”. That may sound like a drastic solution, but it captures the urgency of rethinking the social democratic approach, not just in terms of policy but in terms of concepts and language. I’m not surprised by the findings considering that all the media outlets brainwash the people with all the vacuous propaganda which blames poverty on individual factors. God, this makes for depressing reading. It counts in social democrats’ favour that our understanding of ‘poverty’ is the one on which official *measures* of poverty are based. The Tories can promote whatever misunderstandings they like, but that won’t mean their own (government) figures don’t show child poverty rising. But maybe this illustrates the wisdom of talking more about inequality and less about poverty. It’s easy to grasp that inequality is something affecting ordinary people, whereas when people think about ‘poverty’ they probably think of *extreme* poverty. Presumably one big factor is that people tend to think of themselves as middle class – neither rich nor poor – and so there are many people who would call themselves middle class yet be in relative poverty on an income scale. So the public’s definition of poor isn’t households below 60% of median income, but it’s those that live in back to back housing, who can’t dress their kids properly, whose kids can’t write their own name when they arrive at school. When you are looking at that portion of society, addiction, family breakdown, etc. are likely to play a bigger role in maintaining those levels of poverty that in other sections of society. To be honest, those are the kinds of children that need the most help, those that need their parents to lose their addiction (if they have one), to receive their help from Sure Start, etc. etc. A lot of people probably look down on those parents, but feel great pity for the kids, and so think that a lot of their parents are work shy and addicted. Now of course addiction to drugs is probably overplayed (although alcohol addiction may be more prevalent than we think, just as with other sections of society), but I’m sure there are many people in that bracket who have generations of people in their family that haven’t worked, who don’t have the skills to work, nor the motivation, and it is these people that the general public think are getting benefits that are too much. They still care about those kids in poverty, but they think government policy doesn’t help those people, only make it worse. In a way the Conservatives are taking on the poverty agenda because they have realised (as have most people that engage with families living in extreme poverty) that chucking money at those families doesn’t solve the problem (indeed, that’s why places like SureStart are so valuable, because they provide community, support, advice – all things that are massively more important than JSA). They’ve realised that it’s about tackling the underlying issues for the individuals experiencing the most extreme levels of poverty. 1) Handing out money doesn’t solve some of the most defining issues in the poorest households. 2) Social issues do affect the wholeness of a child, which in term shapes how that child engages with society, including how able they are to do well at school, to find a job and succeed in it, and to raise a family of their own. To admit that doesn’t make you a fascist it makes you a realist. 3) Many people don’t see themselves as poor and so the language used needs to change. I would add to this that the left and right need to realise that you can’t successfully tackle inequality through the tax system – it’s just a sticking plaster. Much attention should be focussed on improving equality of opportunity, such as early years (and later) education, help with parenting for those parents who need/want it (many would love it), apprenticeships available for young people, and work experience generally – many practical thing to help people make a positive start in life. Then, more broadly, they must tackle structures around land ownership, housing, how much power people have just because they’re rich, etc .etc., things that prevent many fulfilling their potential whilst others continue to get ahead for generation after generation, leaving the rest behind. In summary, a narrow focus on incomes is ill-judged, and so too the focus on those under 60% of median income. For those in most extreme poverty real solutions that impact the real issues must be found, and to benefit those that don’t see themselves as poor but whom have relatively low incomes (about whom a new political language must be created) strides should be made to increase both equality of opportunity and social mobility, which will actually benefit the rest of society also. I can assure you there aren’t. See here for a basic account http://www.leftfootforward.org/2010/09/the-myth-of-the-intergenerational-workless-household/ but there is more detailed research coming out shortly which completely dispels that myth. More generally , I think you’re right about attitudes but there is a question as to how well people’s categories fit the social reality.